Click “Create a Page” from the Facebook login screen. Select the option that most closely aligns with your business purpose. Tip: Be as thorough as possible as you enter information to get the best results. For example, the About Us field is heavily weighted in Facebook search results and entering complete contact information including phone number, website URL, and a contact email address makes it easier for prospects to learn more and engage with you. Upload a profile shot or avatar. Tip: Since your profile shot will overlap your cover image; try to keep the lower left portion of your cover shot image clear. Your best bet is to use your business logo or a headshot for the profile image and use the cover shot to communicate your broader brand messaging. Tip: Use your cover shot it to give your business personality, but it’s against Facebook policy to use the cover shot to advertise specific deals, contact information, or calls to action. You can do that on your Timeline or build a Facebook app. Resist the urge to repurpose an existing Facebook personal account. 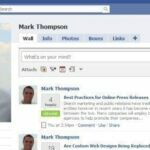 It’s against Facebook rules and the business Timeline is designed with more features and functionality to support business. For example, managing page “Likes” on a business Timeline is far easier than managing “Friend Requests” on a personal Timeline. The business Timeline also includes Insights to help you increase engagement with metrics to understand and analyze your Facebook user base. Use Milestones to tell the complete story of your business. If your business has been around for awhile, add Milestones to mark when the business was founded, when you finally moved the office out of your parents basement, and other fun stops your business has taken along the way. Arrange the Views/Apps Ribbon to further establish your Facebook presence. Your Timeline can have a maximum of 12 apps, but only four are displayed on your Timeline. Your Ribbon is preloaded with default apps, like Photos, Likes, Map, and Events. You can also create custom Facebook apps to promote specific products or specials, to give users direct access to support, or to create games and contests. Go to the Admin page to select the four apps you want users to see when they arrive on your page. Don’t just post about your business. To engage users, you need to talk about more than just how great your product is, the employee of the month, or your latest releases. Go searching for content related to your business that would be of interest to those looking for your product. If your time is limited, find a good auto-posting app that uses your keywords to automatically post related content to your Timeline without putting in the work to find it yourself. Now that your business is up on Facebook, it’s time to get social and post something!